Pyramidal, common spotted and a hybrid orchid were in flower on the plateau at Townclose Hills Nature Reserve, also known as Billy Woods. Despite the breeze we saw ringlet, meadow brown, small tortoiseshell, small skipper and a few marbled white butterflies. Six-spot burnet moths were also active and a hebrew character moth lurked amongst the grasses. 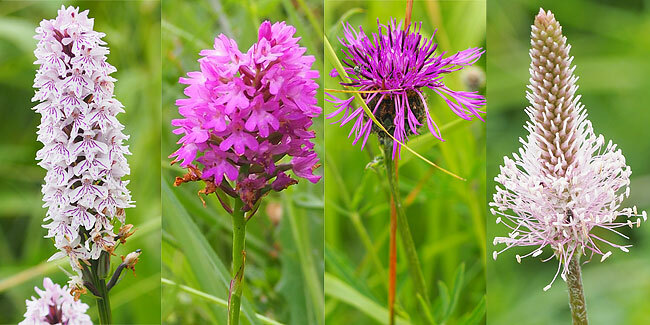 Hybrid orchid, pyramidal orchid, grater knapweed, hoary plantain. One of the smallest orb-web spiders, Araniella curcurbitina, was making its way across a grassy path. It’s Latin name, curcurbitina, means ‘a little member of the gourd family’; its bright green and yellow striped abdomen looks like a water melon or gourd. It has a scarlet patch on its underside. Restharrow, clustered bellflower, wild marjoram. We spotted a brown hare in a field in the valley of Kippax Brook to the west of the reserve. 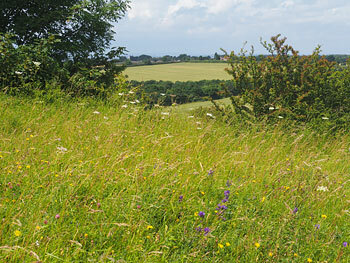 Townclose Hills, Kippax, is a Leeds City Council Local Nature Reserve managed by the Yorkshire Wildlife Trust. In Wakefield, the tawny owl family is doing well. One of the youngsters left the nestbox earlier this week and a second one has been preparing to go by scrambling up to the entrance hole. As well as bringing in birds and small mammals, the adults have been seen feeding frogs to the youngsters. 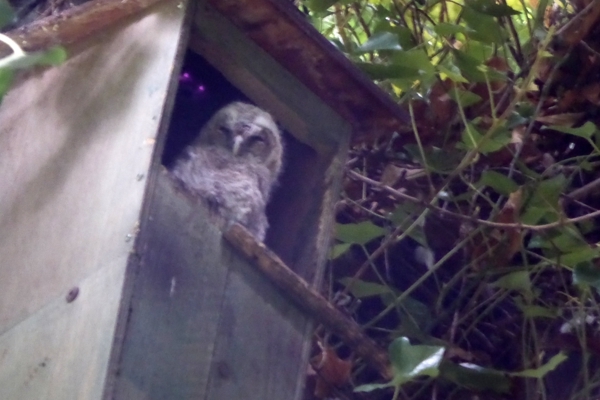 The first tawny chick to leave the box. The second chick trying to get to the entrance. There is lots of dense ivy and a large Lleylandii hedge close to the box to provide the necessary cover in which fledgelings can hide during the daytime. 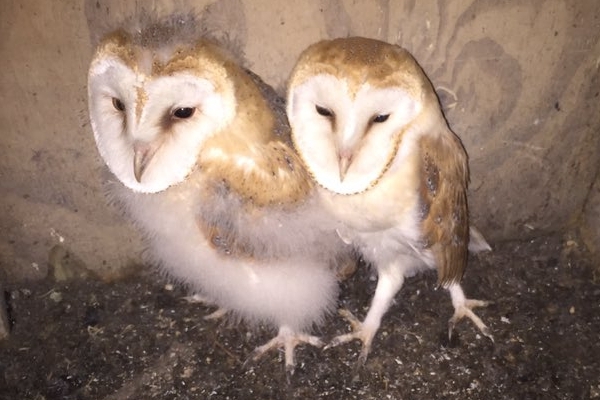 Meanwhile, Young barn owls at a site in the Wakefield area have grown well and have been starting to look outside their nestbox this week. 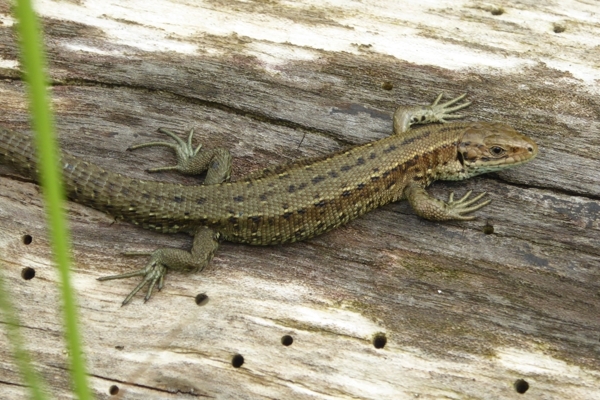 A fruitful trip to Brockadale resulted in a great encounter with these common lizard (Lacerta vivipara) found basking on a log. .
Like adders, the common lizard manages to reproduce in our relatively cold climate by bearing live young, rather than laying eggs as do most other reptiles. Grass snakes are found in the Brockadale area but they reproduce by laying eggs. They cope with the British climate by putting the eggs in piles of rotting vegetation, such as compost heaps, where the heat produced by the decomposition keeps the eggs sufficiently warm. The moth trap regularly brings in species that I have not seen previously in my garden. 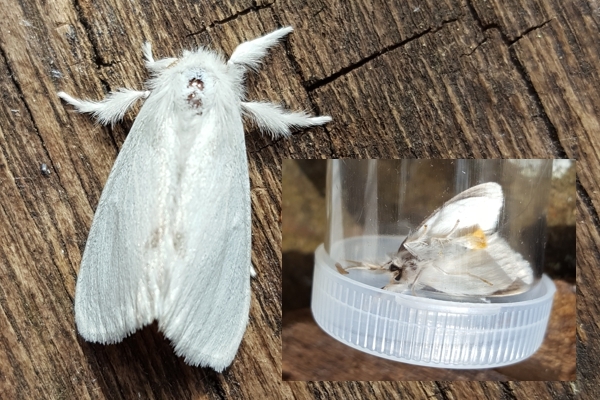 Last night, a new species was the satin moth (Leucoma salicis). At first glance, this is similar to the yellow-tailed moth (Euproctis similis) but there are several differences, including size. 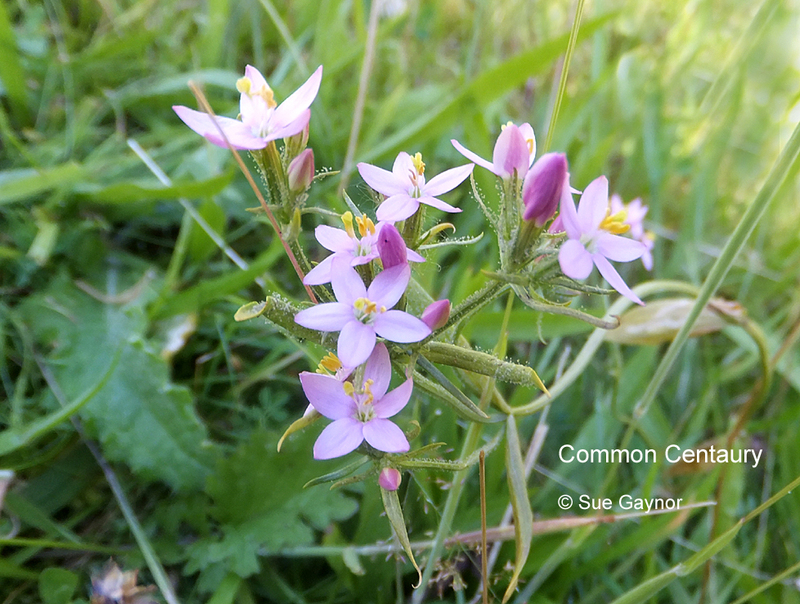 Another new species seen was campion (Sideridis rivularis). 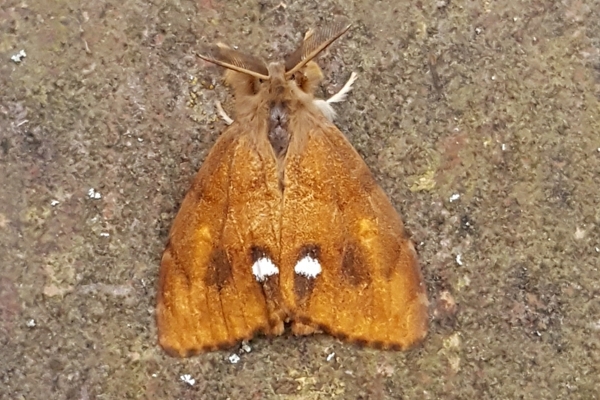 The vapourer moth is very common but it hasn’t turned up in my moth trap until last night. This species has flightless females. Recently, I’ve been making the effort to identify some of the tiny micro-moths. 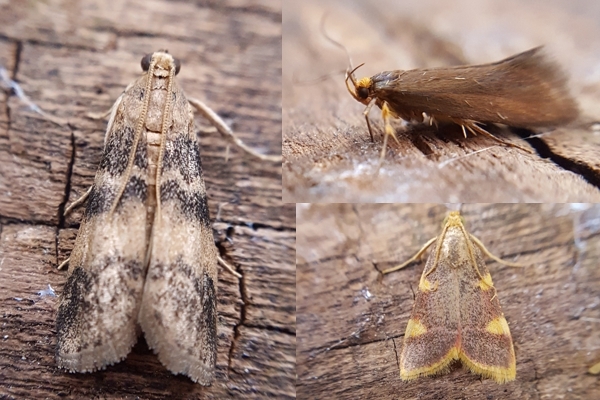 Starting on the left and moving clockwise, the following picture shows bee moth (Euzophera pinguis), golden brown tubic (Crassa unitella) and gold triangle (Hypsopygia costalis). The bee moth is one of several species that cause problems for beekeepers by damaging the combs in beehives when they are in storage. 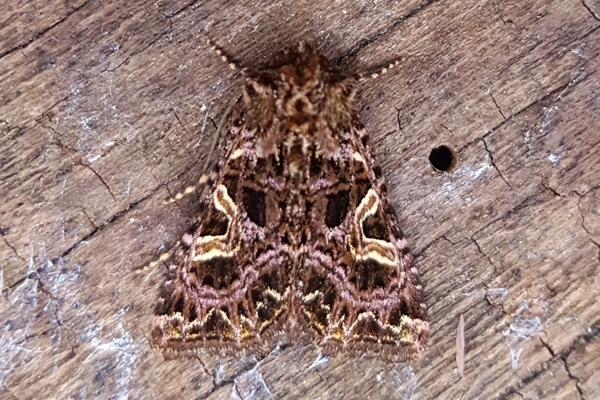 The larvae of the golden-brown tubic feed on fungi and dead bark, whilst the larvae of the gold triangle feed on dry vegetable matter, such as hay and straw. 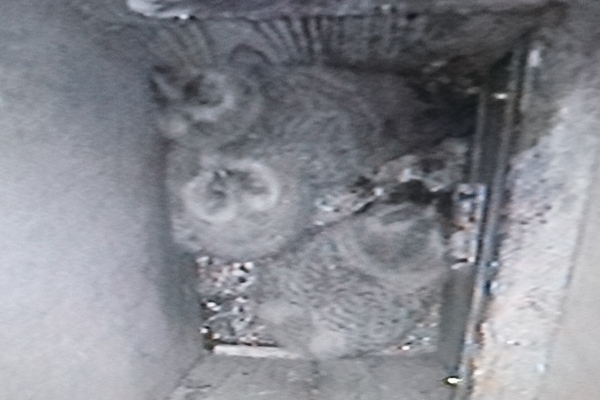 The two oldest of the tawnyl owls in Wakefield are now approaching three weeks old and the latest picture from nestbox camera shows that all three are growing well. Meanwhile, at Ackworth the two tawny owl chicks being reared in an open-fronted kestrel nestbox are presumed to have fledged but I haven’t had time to locate them since they left the nest. People frequently ask whether the young peregrines are still around. This is a reasonable question as we do not know exactly when they will move out of the parents’ territory, though this should happen by late autumn. 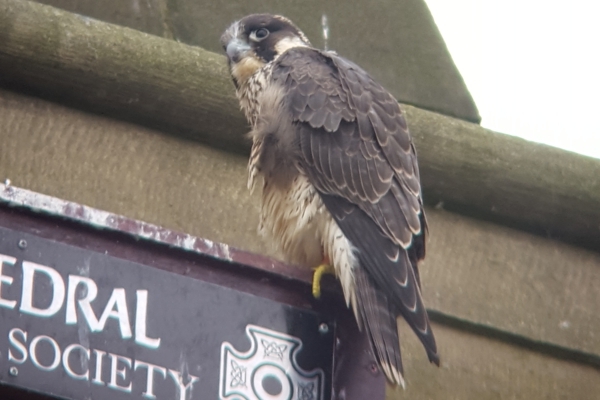 We’ve had one or two reports of sightings in the past couple of weeks but my mission today was to find out exactly which of the three surviving youngsters are still around. 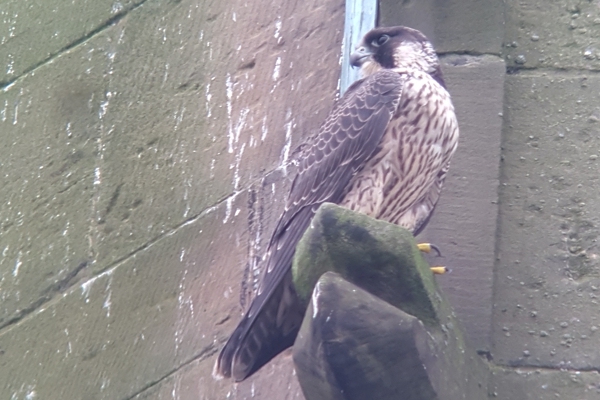 The good news is that I located all of them and all three were on the spire at one time, with the female sitting at the top. The only peregrine that I didn’t see was the adult male. The first to be seen was 3Z and this was the most active of the three. I watched it chasing pigeons above shops at the lower end of the precinct and I saw it chase one at alarmingly low level. It dropped below the roof-tops in the side-street by Boots and it turned the corner sharply to enter the precinct. It’s easy to see how the juveniles can die because of high-speed collisions. 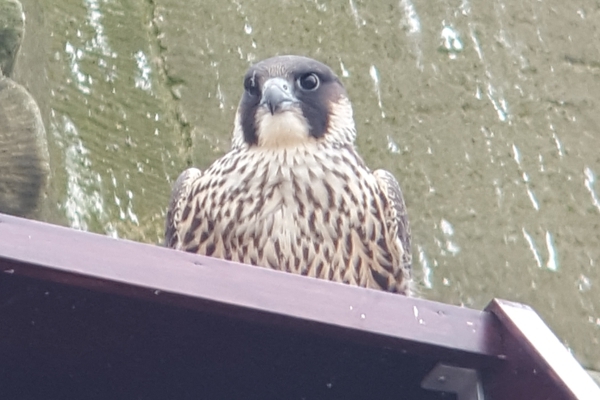 5Z turned up next and spent its time sitting on the nestbox. 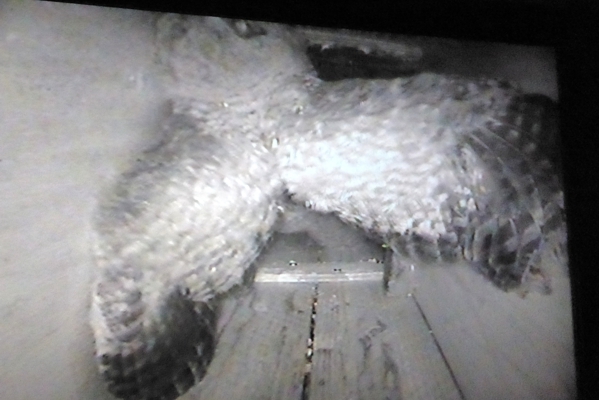 This isn’t surprising as this is the juvenile which continues to go into the box as it searches for food. It obviously associates the box with a ready meal. 6Z was the last to appear, settling half way up the spire. In Hemsworth, the moth trap has been attracting some familiar species recently. 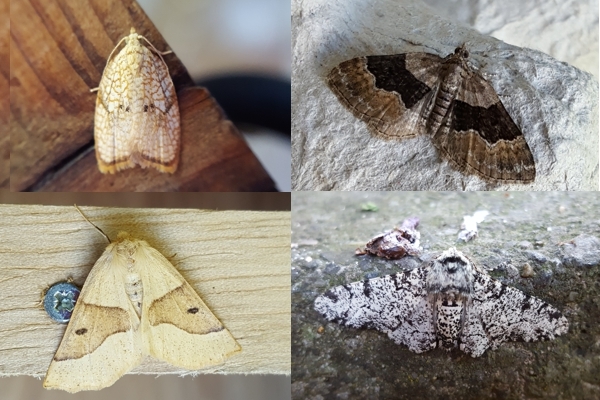 In the following picture, clockwise from top left, there are maple button (Acleris forsskaliana), shaded broad-bar (Scotopteryx chenopodiata), peppered moth (Biston betularia) and scalloped oak (Crocallis elinguaria). When using a moth-trap, it’s always a good idea to check the outside of the box and any nearby objects as moths often settle there. 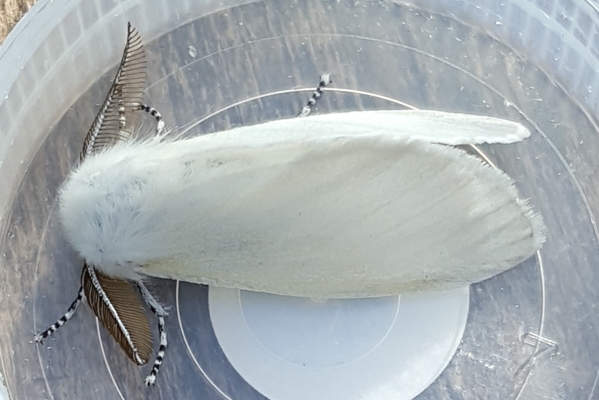 This swallow-tailed moth was resting on the step below the trap. 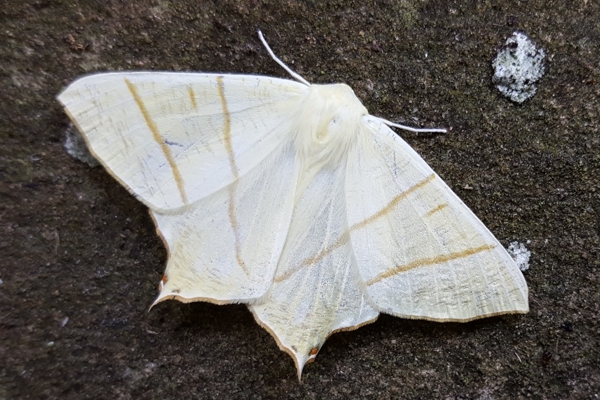 The swallow-tailed moth is a large, attractive species which often comes to the trap. When you first start using a moth trap, it is a surprise to find how many species visit an ordinary garden regularly. 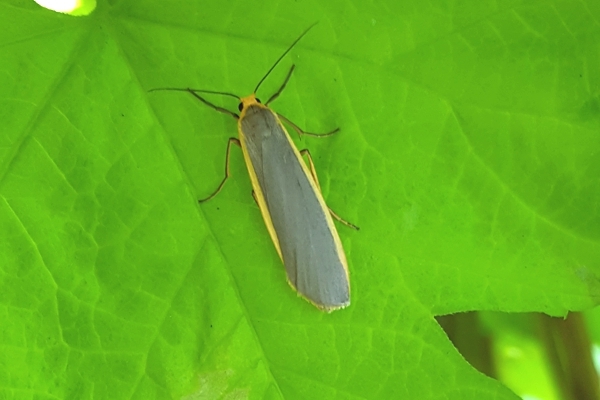 A favourite of mine is the common footman. The small “micro-moths” can be hard to identify but it is worth having a close look at them because of the range of colours and shapes. 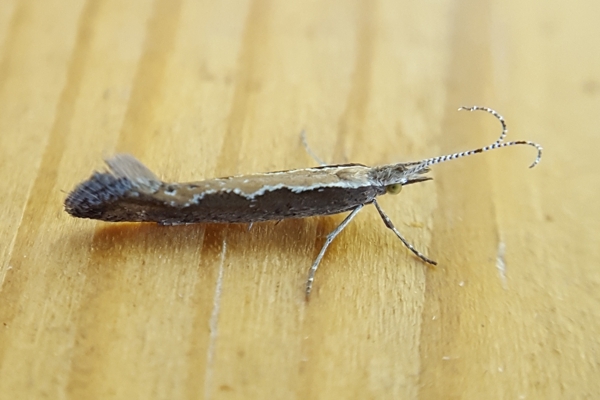 This diamond-back moth is also a common species. Its other name is cabbage moths and this moth may well be one of the culprits behind the damage to young cabbages in my garden. I put out the moth trap in my garden in Hemsworth last night, expecting a good catch because of the warm, humid conditions. As well as the usual moths, an interesting beetle flew into the trap. 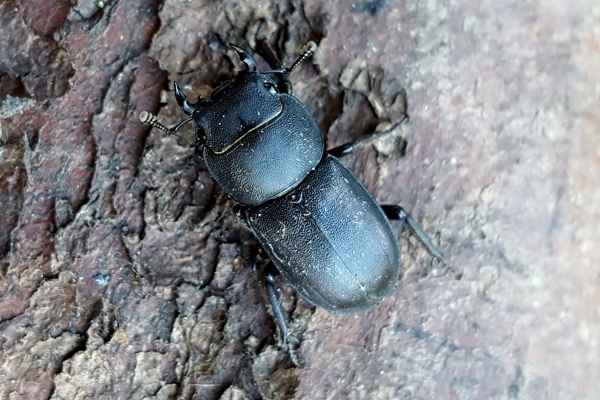 I identified it as a male lesser stag beetle. This species needs rotting wood on which its larvae can feed. It is described as common but this is the first that I have seen in my garden. 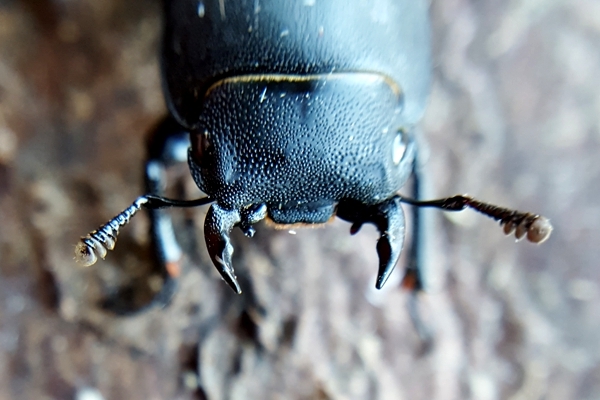 Jaws on lesser stag beetle. In a wooded area at Ackworth, there is a fallen log, about 70cm thick, which has been lying on the ground for several years. 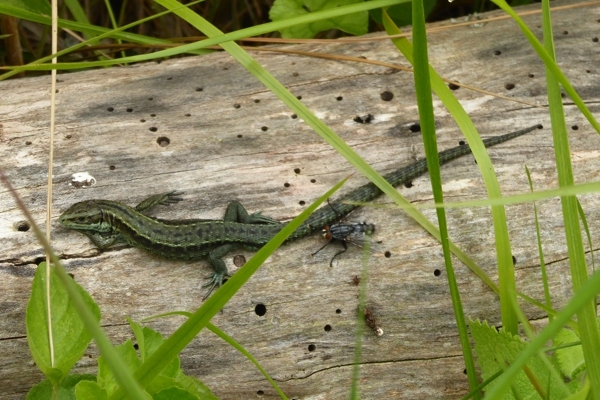 About two weeks ago, I lifted a piece of bark from the log as I helped young students to search for centipedes and millipedes and I was surprised to find two great-crested newts beneath the bark. There are plenty of other spaces on the log, beneath bark and in cavities, where there may be other newts, so I will be asking the gardeners to leave the log in place. Yesterday, Colin Booker and I had a look at the log and we found a couple of interesting fungi. The first one is a Coprinellus species, a small ink-cap. We think it is Coprinellus micacea (Glistening Ink-Cap) or Coprinellus xanthothrix but I’ve read that a microscopic examination of the spores is needed to separate the two. 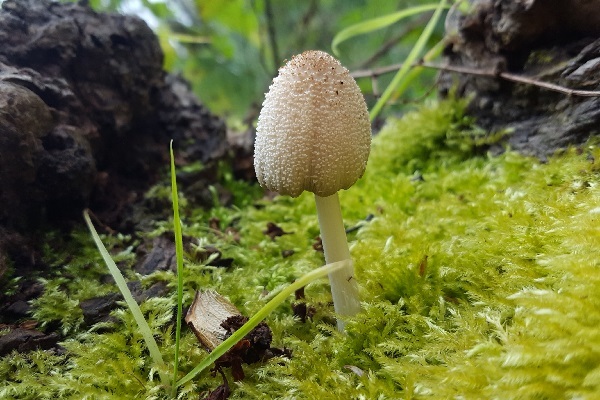 Coprinellus xanthothrix is the rarer of the two species. By this morning, as is normal for an ink-cap, the cap of the fungus had liquefied. 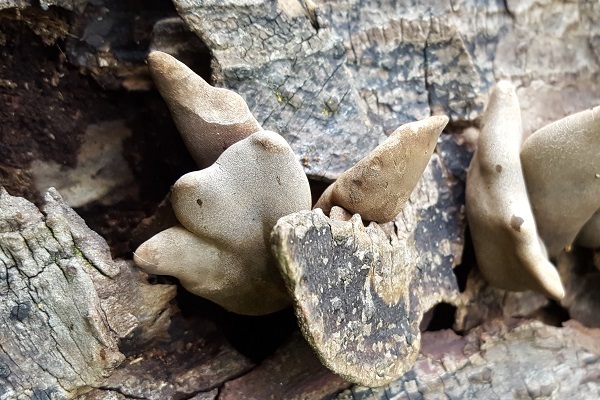 Our identification for the second fungus is a little more certain. 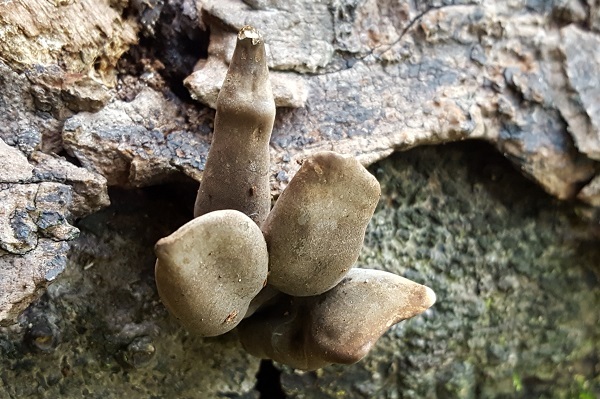 We think this is Xylaria polymorpha, which is commonly known as Dead Man’s Fingers. 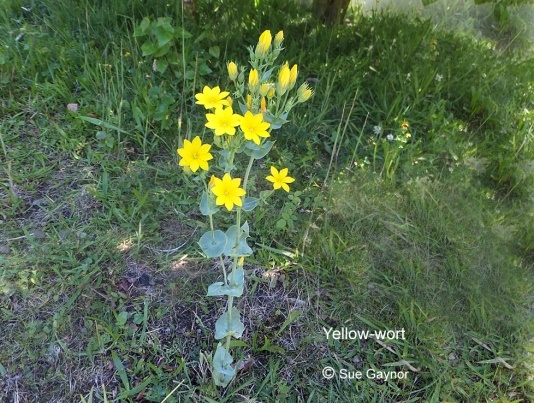 I believe this species, as its name suggests, is quite variable in shape and colour. I expect it to darken as it ages and I will check on this in the next few days.